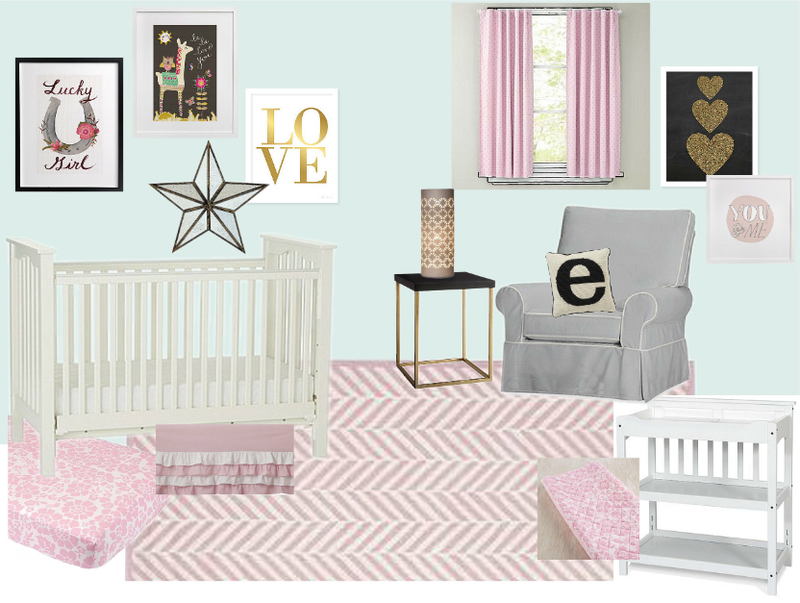 My latest room design is for my good friend Sarah, due with a baby girl in a couple short months! Sarah envisioned a room with blueish-green walls and touches of pink and gold. I added in some black accents for a little extra drama! Sarah had chosen some great basic pieces of furniture to build the room around such as the crib and rocking chair from Pottery Barn Kids. From there I picked a soothing wall color (Embellished Blue by Sherwin-Willams) and had fun pulling together a gallery of sweet, girly prints from Minted and Etsy. I paired a Land of Nod crib sheet with a ruffled crib skirt from Target. Never feel like you have to be constrained to a bedding set – it is more fun to mix and match! Both gold and black are great neutral accents for a room. I like how the black contrasts with the soft pinks and green-blue wall. Interested in a particular piece from the room? Here are the sources!